Fab party for Mrs & Mrs Garner’s wedding at Forrest Hills hidden away in the Ellel area of Lancaster. Quite the unique venue set in 180 acres on the edge of the forest of Bowland makes for an idyllic wedding setting. 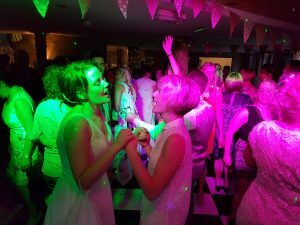 Rebekah & Danielle hired wedding DJ favourite Andy B for their evening reception… wild night ensued! Congratulations Mrs & Mrs Garner!